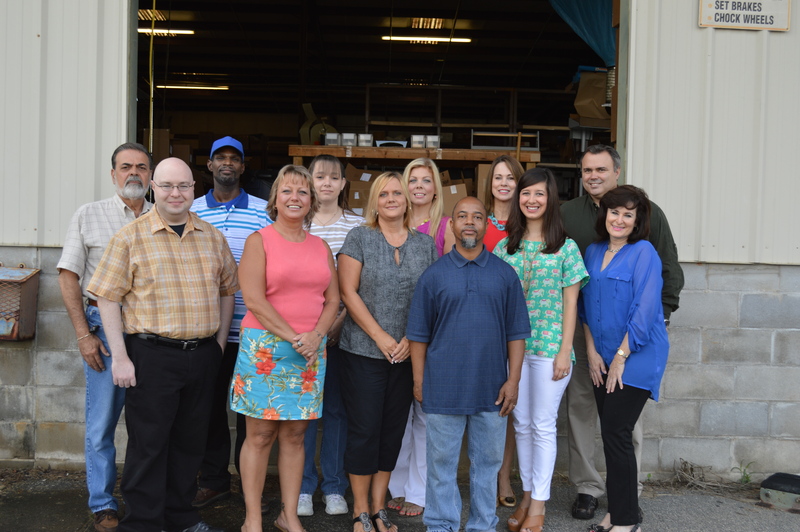 Meet Kevin’s Employees – We Call Them Superstars! Kevin’s growth over the past 40 years, from 200 square feet expanding to two stores, a catalog and an international clientele has been an amazing journey which is exciting to be a part of. But our growth is only possible because of the amazing staff that has been a part of Kevin’s throughout the journey. I wish we could mention everyone individually, but with limited space we can only really highlight a few – but each and every one of our staff is a superstar! When you step into the 65,000 square foot warehouse you will always see the smiling Richard Florence and Clarence Bryant both 11 year veterans of Kevin’s. Richard started out in receiving and now runs shipping for Kevin’s Catalog. He prides himself on hard work and giving it his all, and always works hard to do the best job. When Clarence joined Kevin’s, a month after Richard, he had no idea what the catalog industry was all about, but now loves it , especially the receiving side of the business. 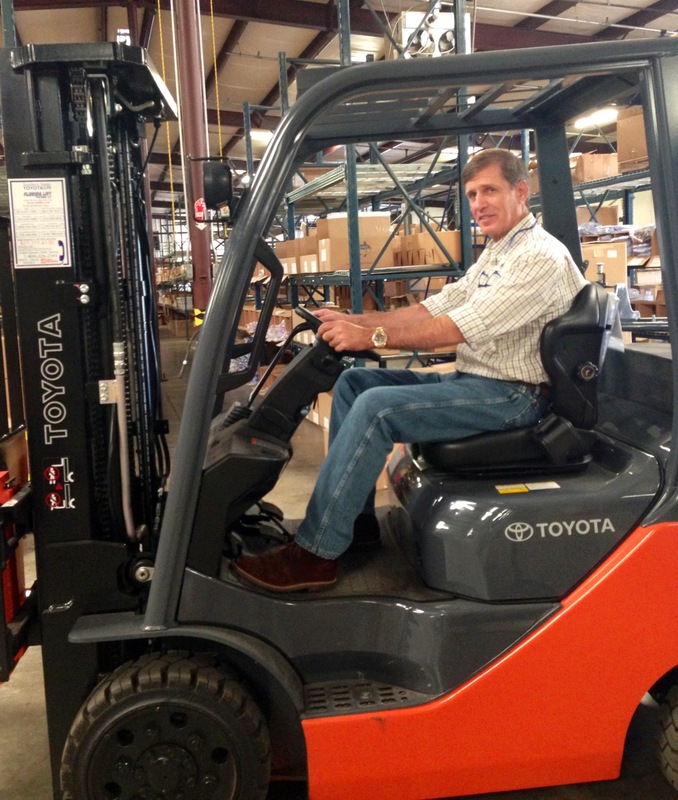 He enjoys learning about new products that come in and loves the challenge of his work. Truly, the heart and soul of Kevin’s Catalog is Rey Pineiro our Director of Marketing. Instrumental in the creation of Kevin’s Catalog, he works hard to insure customers can easily find what they want and have an outstanding experience both in print and online. After 8 years, no day is the same for “Mr. P “ as he is known in house. Mr. P works hard to keep everything fresh and new with many different creative looks, a key reason our customers enjoy shopping Kevin’s Catalog. He keeps the catalog and website interesting and alive. Of course, you can’t say Kevin’s without talking about Gun’s and we are fortunate to have Mike Burnett running our internationally acclaimed gun department in Thomasville. For over four years, Mike conveys his passion for firearms through outstanding customer support. Ever since he he was a little boy he has loved guns. After serving in the Navy he wanted to still pursue this passion. Working at Kevin’s was the perfect fit. He doesn’t consider the Gun Department a career “It is who I am.” Mike’s most excited about the higher grade shotguns at Kevin’s and working with our customers who also share that same spirit. Tallahassee was Kevin’s only store for many years, and there now there are many loyal customers who we have known since the first Kevin’s opened 40 years ago. We know their children and grandchildren, and our customers know that all the outdoor gear they need is at Kevin’s with expert help. If you happen to fish in the Tallahassee area, you probably know Lin Hudson, our Fish & Tackle Manager. His loyal customers feel at home with Lin and love learning about new products and swapping fish stories. Lin has been with Kevin’s since 1984, starting in Guns. Fishing is his passion and sharing that passion with his customers is why he wakes up in the morning happy. 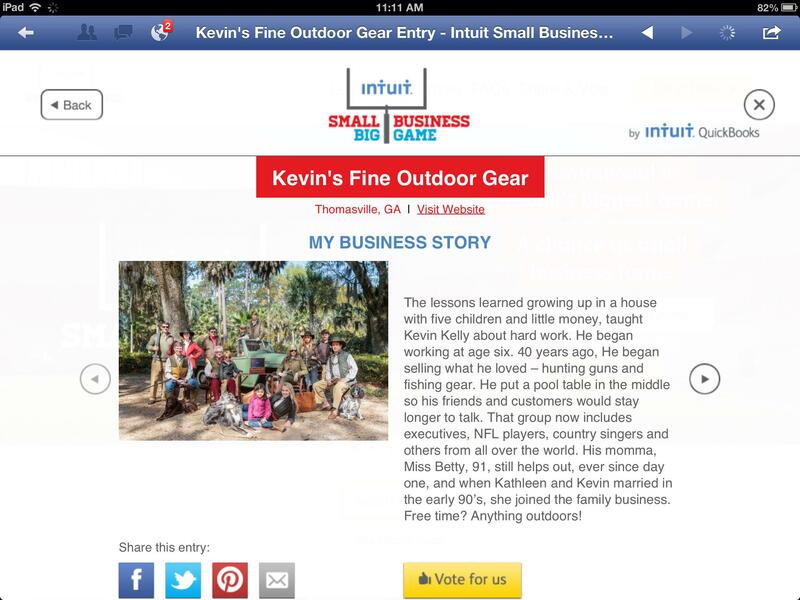 A friend suggested we enter the Intuit Small Business Super Bowl ad contest and we thought it would be fun to win an all expense ad during the Super Bowl, after all, their audience is filled with Kevin’s customers. The first part of the contest asked us to write a 600 character life story – well, we misread and wrote 600 words. The story is compelling and because we had to chop it back down to 600 characters, we wanted our Kevin’s family to know how it all began. So…here is Kevin’s Story in 600 words! Growing up in house with five children and little money, the floor served as Kevin Kelly’s bed and provided strong lessons about money and value which are evident when you walk through the doors of his two stores or view his online catalog and website. As a boy of eight, Kevin saw boys riding the coolest bike around, the Schwinn Stingray – he loved that bike, and wanted one in blue. So he saved enough money by hard work mowing lawns and sweeping the local store. Finally, one day he walked into the bike shop with $49 and tax and ordered that blue Stingray, being the first on the block to have the newest color! That was a great day! At 13, Kevin saved enough money through many different jobs to buy his dream car! $2200 for a Chevy Chevelle – but in his excitement he forgot he needed another three years to drive it! That great feeling of pride and excitement when buying the best with hard earned money has never left Kevin. His goal is for Kevin’s customers is to feel that same pride and excitement with every purchase. Known worldwide, for offering one of the finest gun collections, Kevin began selling what he loved – hunting guns and fishing gear in a 200 square foot storefront. He put a pool table in the middle so his friends and customers would stay a little longer and many of those same people still hang around to talk hunting and fishing with Kevin and his staff. Back then, Kevin had to work for $2 an hour someplace else to make ends meet and allow him to buy the best merchandise for his customers. His momma, Miss Betty, took care of the books on a ledger with a pencil – growing the stack of ledger sheets along with the growth of Kevin’s stores. 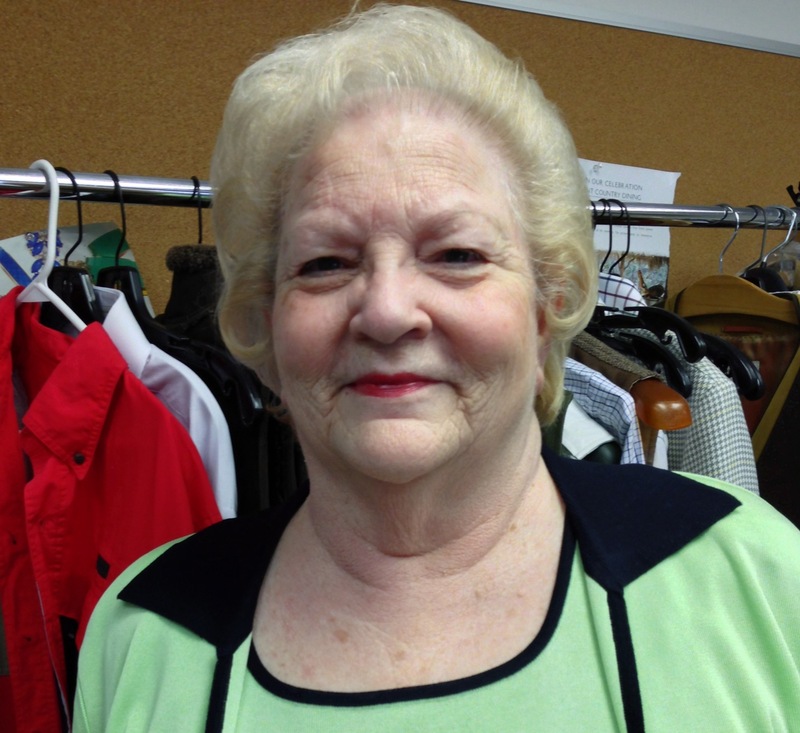 When Kathleen and Kevin married in the early 90’s, Kathleen brought a strong technology background and helped transition Miss Betty from pencils to QuickBooks; she also expanded Kevin’s to the web early on. Kevin’s customers become family and the Kelly’s call them that in everyday conversation. They want the Kevin’s family to have outstanding service and the best selection of goods anywhere. 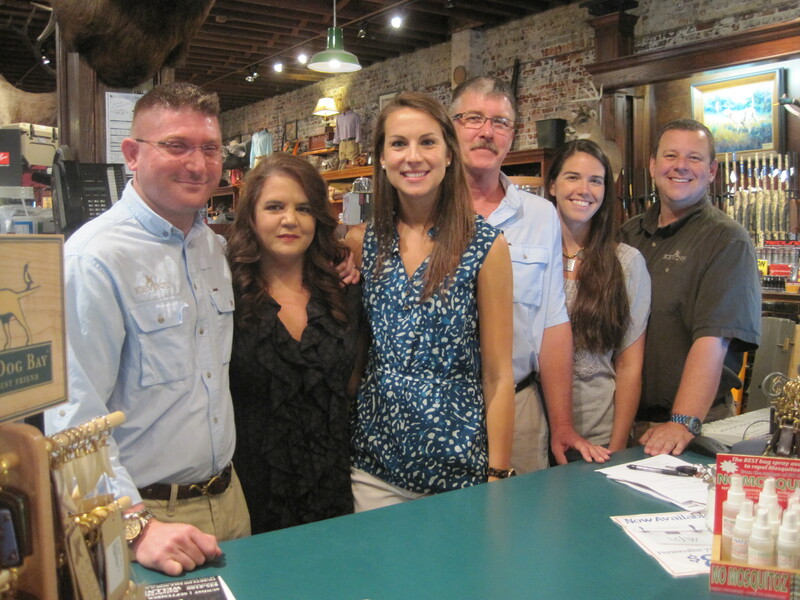 Just ask the loyal customers who have shopped there for over 40 years including past Vice Presidents, executives, NFL players and country music stars who fly into the small South Georgia town of Thomasville or Tallahassee, Florida for a day of shopping at Kevin’s. They come from many continents and all have the same love of the outdoors that Kevin had the day he opened the door 40 years ago. The Kelly’s know their customers, their customer’s children and grandchildren – they hunt with them, they fish with them. They celebrate the outdoor life and its traditions together. It is truly a family business with a home town feel, even for those who fly in from around the world just to shop at Kevin’s. With the internet anyone can buy anything anywhere. Kevin’s is more than that, it is family, it is relationships and knowing that Kevin and Kathleen know who you are. It’s personal. Kevin’s momma always told him to save every penny, pay cash and only buy the best – it lasts longer. Kevin listened to her and now at 91 years old, his momma never needs to give Kevin advice but she does come to his Tallahassee store every day, to check the books and make sure the store looks its best, because, after all, his name is on it. With hunting season just around the corner and the Kevin’s catalog arriving in mail boxes this week, I get excited thinking about this season in life. It makes me think of tradition, dogs, entertaining and more importantly spending time with family and friends. Children join their parents, grandparents and friends in the field. While I love hunting too, I also love that men, of all ages, enjoy the camaraderie of the hunt many times throughout the season. 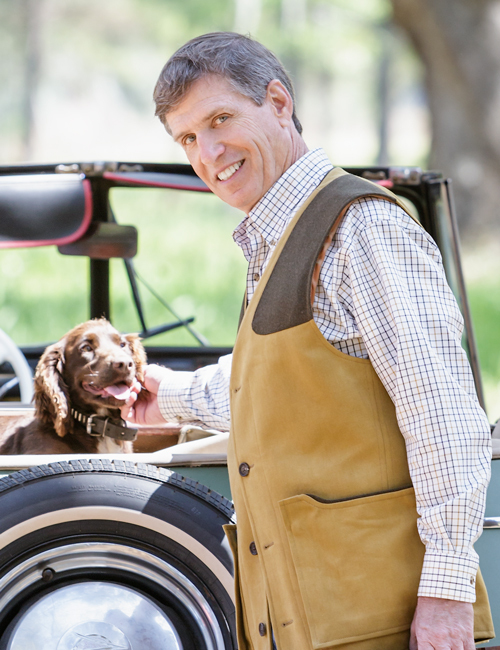 No hunt is complete without dogs, fine guns and celebration! It’s the perfect time to share the stories of the day. Hunting is a wonderful way to celebrate the abundance of nature while respecting and preserving the great outdoors. I am filled with pride when I see the young adults, who came to Kevin’s as children, now showing their skill and enthusiasm by posting their trophy’s on Facebook and visiting us at our stores. Kevin’s Fine Outdoor Gear and Apparel lives this tradition. That is why we choose to feature family, friends and dogs on our first cover. 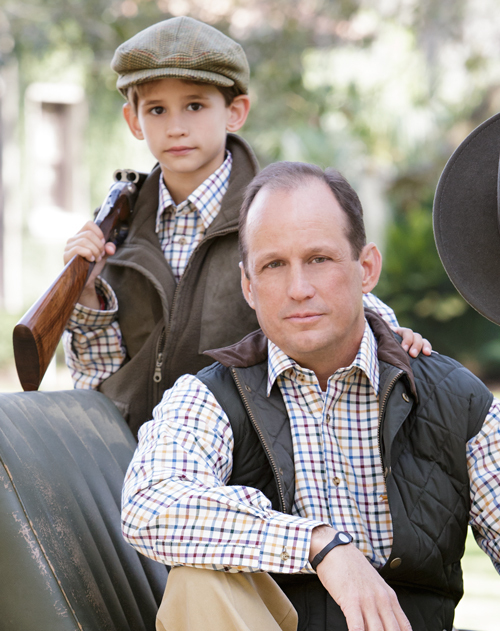 We hunt, we love our dogs and our children grow up next to us, outside, together. 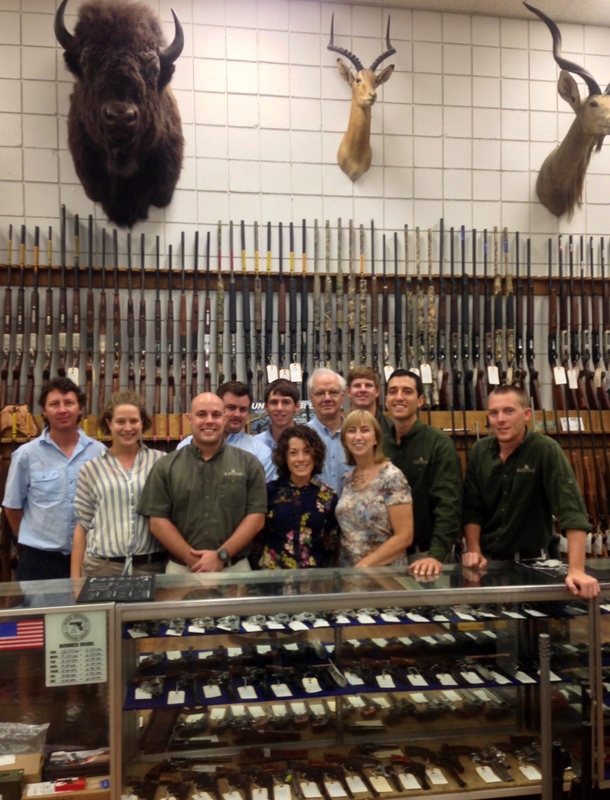 Over the past 30 years, Kevin’s has been providing the finest in guns, gear and lifestyle merchandise to our customers. We put our heart and soul into buying and designing what we feel is a product selection that you will love; but your feedback is always important to us. All of the clothing, gear, and guns shown in our catalog are a small representation of what is available in our stores and online, so always let us know your thoughts, because it is all about you. People always wonder who is in our catalog – are they models? Can they shoot a gun? In fact, they all love hunting and they are our friends and family . The dogs you see are their dogs and this Kevin’s catalog features a historic plantation in Thomasville, Georgia. It makes sense to kick off the season at this location because it truly represents tradition and the outdoor life. Thomasville and Tallahassee is surrounded by many shooting plantations that are busy from September until the last hunting day allowed. I can hardly wait for the first dove shoot even though it will be hot, because it is so fun to see all of our customers back at Kevin’s. Thank you for all of your continued support of our family business. Doug and his son Eli love dressing alike! They look great in their matching tattersalls I love Doug’s look in his medium weight Barbour Lowerdale Gilet and Eli sure is sporting in his children’s vest and Joules tweed hat! Allyson is stunning in her Joules Tweed Fieldcoat and Fox Sweater new to Kevin’s this season.